We need to collect your personal information in order to provide you with the dry-cleaning services you have requested we undertake. This request and our agreement to provide dry-cleaning services constitutes a contract and we will therefore require the ability to process your data in order to fulfil this contract and provide the services to the standards expected by the TSA and Guild of Cleaners. We also collect, store and process this information based upon a ‘Legitimate Interest’ because without it we would be unable to provide you with the dry-cleaning services and as you use our dry-cleaning services may also be interested in offers and promotions. Personal data may be provided to Blue Dragon in a number of ways including directly from you (email, post, in person, website), recommendations or forwarding of relevant information from associated parties. We retain your records for 5 years post completion of the last piece of dry-cleaning work, after which time you can ask that we delete your records if you wish. 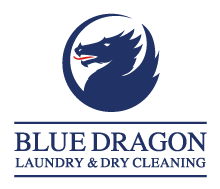 You may do this by contacting any member of our team by phone, email dpo@bluedragondrycleaners.co.uk. Should we not be requested to delete your records, these will be retained indefinitely in order for us to provide a better service at a later date without having to collect personal data again. Your records are stored electronically on our office computers and hardcopies are stored in a locked facility. Electronic records are backed up daily and stored securely in the cloud. You have the right to see what personal data we hold at any time and you can do this by contacting any member of the team or emailing dpo@bluedragondrycleaners.co.uk and submitting a “Subject Access Request”. We will respond to this request within one calendar month. If you decide that you don’t want us to contact you anymore, you are welcome to email us at dpo@bluedragondrycleaners.co.uk to ask us to stop. This request will be reviewed and we will respond to you within one calendar month. If you are asking us to stop sending marketing information, we will do so immediately. You are also able to click on the unsubscribe link at the bottom of any communications. If you would like us to erase all of the data we store and process for you, or you would like us to update or amend data held, please email us at dpo@bluedragondrycleaners.co.uk We will respond to your request within one calendar month but hopefully sooner. If you feel that we have mishandled or breached our responsibilities in handling your personal data, please contact dpo@bluedragondrycleaners.co.uk. We are strongly committed to protecting your personal data. Should you be unsatisfied with our response, you have the right to raise your concern directly with the Information Commissioner’s Office, the UK Data Protection Supervisory Authority.